If you like crab cakes, fish patties and salmon patties as much as I do, you will love these new patties. 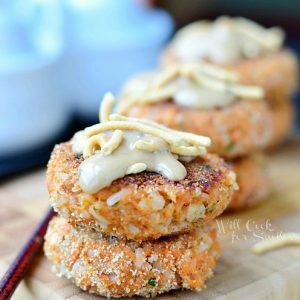 These Asian Salmon patties are made with Asian ginger flavors, toasted almonds, rice and more yummies! They are very easy to make and only take about 30 minutes. Only a few days left before school starts! Many people seem to be so excited about it but I’m just anxious every time I think about it. I don’t want my little man at school all day. I guess it’s a normal mom reaction, I’m more nervous about him being at school all day than he is. People tell me that it will pass but it hasn’t yet. Although, I do love it when he runs to me and hugs me when I pick him up from school. My school starts in two weeks as well. It will be my last year of grad school. I really didn’t expect for the time to fly by so fast but I will be graduating in May. Even though I’m very excited to graduate, I still have to make it through this year. It’s promising to be a pretty tough year. I’m taking more core classes and no electives. I’m also going to be working as a Graduate Student Assistant and helping professors with undergraduate classes. I’m very excited about helping professors because I want to teach eventually. I picked up my department keys yesterday and almost squealed in excitement. It’s a good thing that I’m very excited about this year because the reality is pretty terrifying. I will have a full course work load, working with professors teaching undergrad and I can’t slack on taking care of my family and home. Oh and did I mention that I have to research, contact and apply to several PH. D. programs across the U.S., before January?! Yikes ….it will be one busy year! But don’t worry, I will still be here and I will still be cooking! Although, I’m going to have to scale down on hours spent in the kitchen…probably to about an hour a day (on week days.) I have many 30-minute recipes up my sleeve but I’m always looking for more. During school time, I also look for ways that makes cooking a little easier and faster. I found these new Kraft Recipe Maker sauces while grocery shopping and I decided to try it. They are ready sauces that are used while cooking and as toppings. They come in many different flavors with so many possibilities. Pssst….there are also a couple of recipes on the box and inside. It seemed a little too easy for me though. 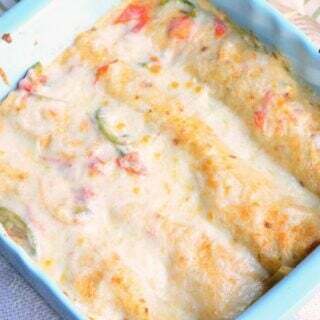 You know me, I love to create new recipes! Preheat a medium frying pan with oil, on medium heat. 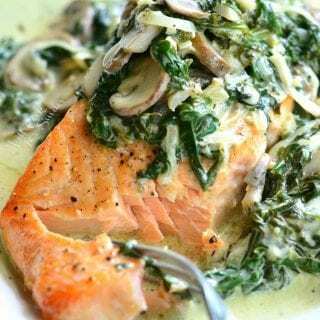 Drain the salmon juice off and squeeze most of the juice from salmon, but not all. 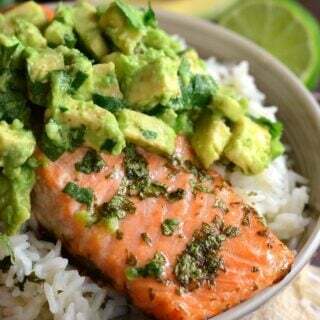 Combine all the ingredients (except the creamy teriyaki and rice) in a mixing bowl and mix well. Add rice and mix until all evenly combined. 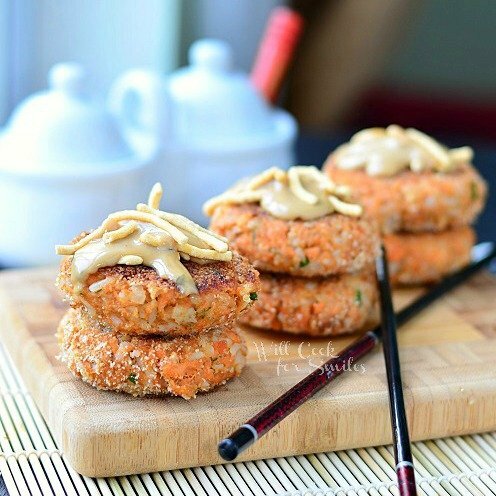 Form salmon patties and lightly coat them with bread crumbs. 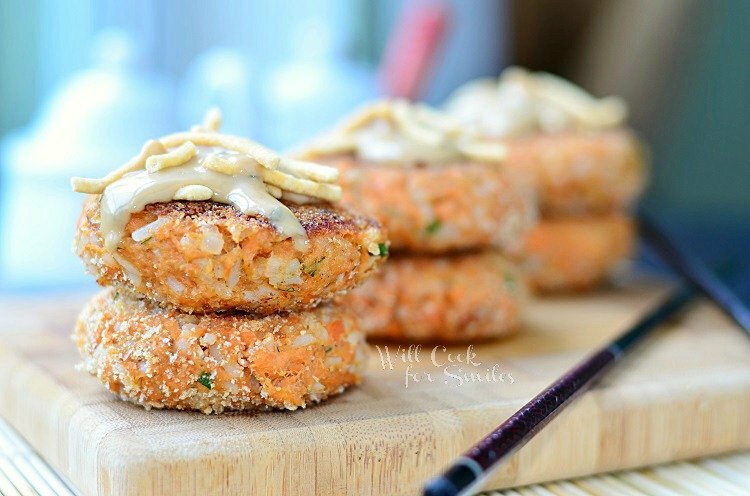 These salmon patties turned out SO delicious! Such a simple and quick meal to serve with a fresh salad! 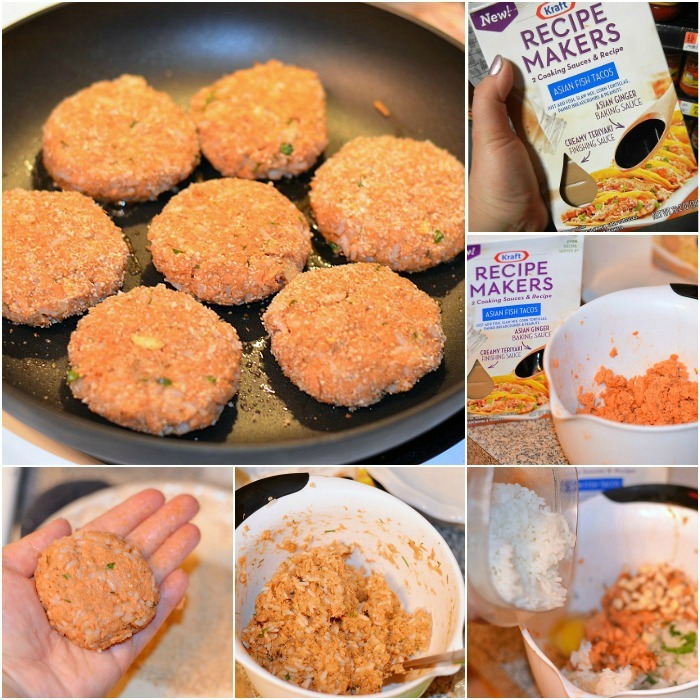 It will only take you about 30 minutes to cook these salmon patties but the family will devour and think you spend hours making them! You can keep up with Kraft Foods on Facebook for promotions, coupons and product announcements. You are amazing! I can’t believe you do all this amazing cooking AND go to school! Good luck with everything! These patties look so yummy! These look delicious! It’s almost back to grad school time for me too. Trying to prepare myself for the craziness! I’m a Criminology and Criminal Justice major. These salmon patties sound delicious. Great flavors! Beautiful photos! Thank you and thank you, Bill! Thank you!! I think the egg and the bread crumbs play a big role in them staying together. Hope you give it another try! These are gorgeous and sound really good! 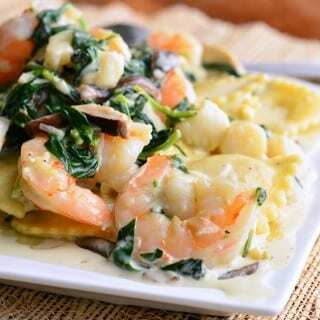 Nice job coming up with a new recipe with the Recipe Makers sauces. Love this recipe, Lyuba! Thank you so much, Andi!! They are look darn delicious! Will definitely try! Pinned for later! You brought back memories for me of having the little ones in school all day and then by the time they are in High School, I was grateful they were in school all day. Continuing education with a family is very difficult, but you will be very successful in the endeavor. 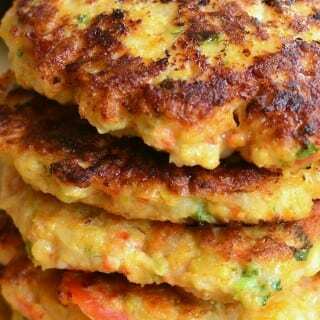 I love the flavor for the Salmon Patties, a new approach for the Salmon Pattie, we will just love it. Thank you so much for sharing your delicious recipe with Full Plate Thursday. Haha, that’s what my mom says too, Miz Helen! Whoza! That looks delicious Lyuba. I love that you used the Asian Fish Tacos Recipe Makers! Totally need to have these on hand. Do you think I could use another fish besides Salmon? It’s not my favorite? What about a Halibut or Tilapia? You can even cook a fresh fish and then shred it using two forks to make into patties! 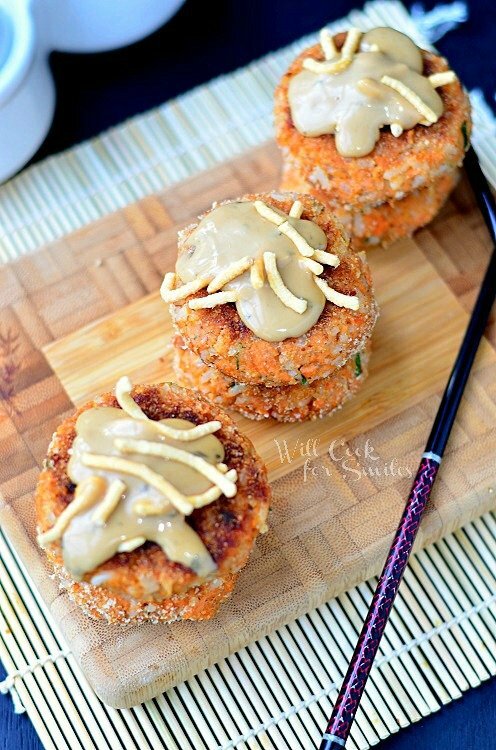 I’ve never seen salmon patties with asian sauce…pinning this. So good! Thank you, Diane! It is so hard to blog and do school. And work! I know you have the kiddos and that is a full time job in itself! But you’re awesome for being able to keep up with it! I’m about done with my bachelors and then I think I will be applying to some masters programs. I think I will do that before I graduate. Still have to take the GRE as well! 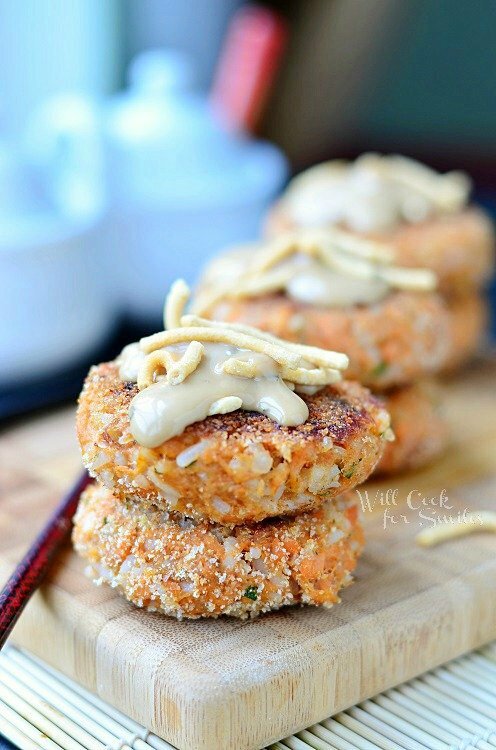 Love these salmon patties. They look really REALLY good! Pinning and sharing on FB & Twitter tomorrow. Have a good evening, Lyuba! Wow! You hare going to have such a busy year!! 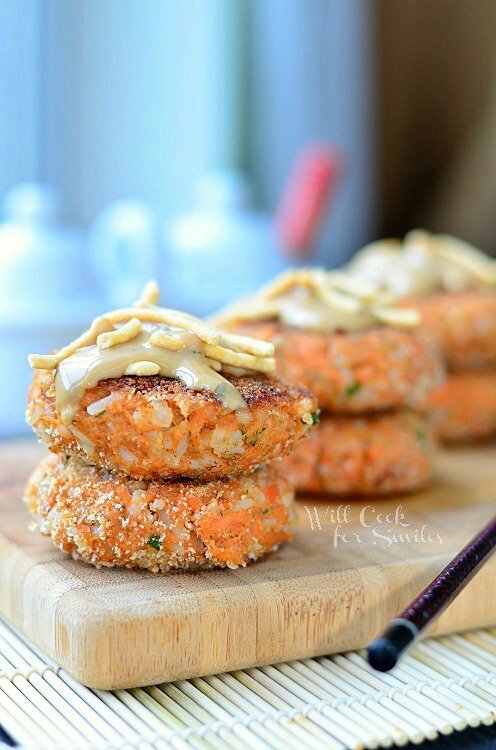 These salmon patties look delicious!! Looks delish! 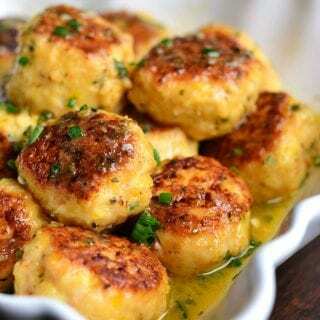 Im going to try this recipe this weekend!